Who’s got those Friday feels? 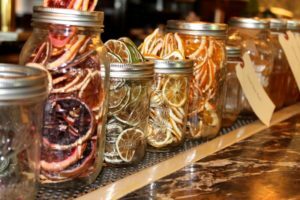 The weather here in Vancouver isn’t exactly screaming, “Let’s hit up a patio!” But, that isn’t stopping me from dreaming – or, more importantly sourcing out a broad who knows how to cocktail. I’ve known Kaitlyn Stewart since we were knee high to a grasshopper, and as life happens it’s been years since we’ve seen each other. 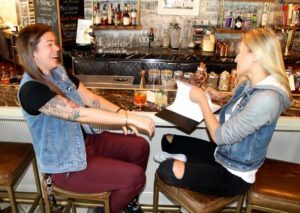 As I walked into the quirky, farm-to-table Royal Dinette where she’s the bar manager, it was as if no time had passed. To give you a little background, Kaitlyn and I met through dancing and commercial acting work as kids – her bubbliness is infectious, and even as an adult she has the same approachability and childish grin that appealed on stage and small screen back then. It’s really no wonder she excels in such a social career. Kaitlyn tells me this is exactly why she’s bartending now, along with the challenges, she gets to bring together so many things she loves, entertaining, cooking and combining flavours, getting to be social – a way to exercise her creativity through different mediums. Now, don’t go thinking I spun my rolodex to any ol’ bartender I knew who could kinda shake up a cocktail. This gal is no rookie. Aside from working in VanCity establishments like Black & Blue and Boulevard before joining Royal Dinette’s opening team nine months ago, Kaitlyn proved she can hold her own behind the wood. She was one of 20 Canadian bartenders selected for a trip to Cuba for her daiquiri making skills this year, she’s gone to nationals for whiskey competitions, and won Smirnoff’s caesar contest. 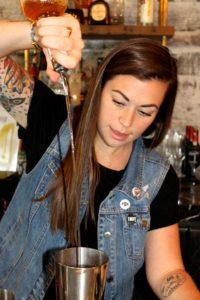 Most notably, Kaitlyn participated in the show Speed Rack Canada which is a female run organization out of Brooklyn, where bartenders battle out five cocktails – based on speed and accuracy – with all proceeds going towards breast cancer research. Alas, enough horn tooting. Here’s the knowledge she’s bestowed upon us to make our summer cocktailing a little more professional. Tip #1: Keep it simple. Make what you like, drink what you like. Don’t choose based on what you look like. If you want to drink a piña colada every day, do it. They’re delicious. Tip #2: The classic cocktails are called classics for a reason. They’ve withstood the test of time. What constitutes a “classic”, you ask? (Well, I asked.) It’s comprised of sugar, bitters, liquor, and water – which can be in frozen form. Tip #3: You don’t have to have one signature cocktail. Live outside the box depending on the occasion, weather, mood – experiment! While Kaitlyn’s go-to cocktail is a Sailor Jerry’s with coke, or a Corpse Survivor (a gin, absinthe and cointreau based hangover cure – hence the name), she shared a couple summery concoctions with me. Talk about a rough day at the office! 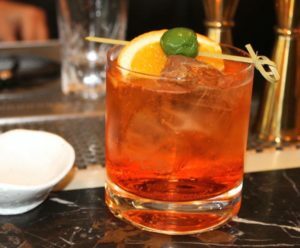 Aperol Spritz: aka: The Summer Stef – patent pending. People think this is a lot harder than it is – so it’s a great entertaining impresser. Simply use a dry prosecco or brut, and build in-glass. No soda, no lemon juice, no filler. A healthy dose of ice. Shake with ice. Strain out over fresh ice. Top with soda straight into glass. BOOM! A big thank you to Ms. Stewart for making our summers even better. Check out Royal Dinette’s menu to see for yourself how innovative and fresh their vibe and creations are. Pop in. Check it out. And say hello to this broad while you’re there!